Appellation or Vine Vermentino di Sardegna D.O.C. 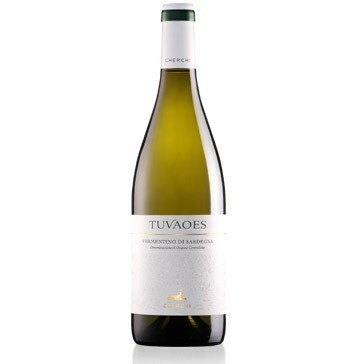 This wine originates from grapes grown on "Tuvaoes" denomination vines. It is the position of these vines, which benefit from an easterly exposure, and the nature of the calcium-rich soil, that gives the grapes their flavour. The wine has straw-yellow colour with a golden reflection. The aroma is fresh, fragrant, strong and very long-lasting. It has a dry, flavoursome, mellow taste with a very pleasant bitterish finish. This wine is particularly good with dishes based on fish, especially if the fish is grilled. 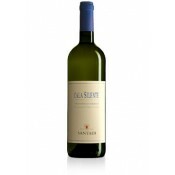 To get the full effect of this wine's aroma, it is recommended to open the bottle a few minutes before serving. The wine should be served at 10 - 14 degrees centigrade in clear, transparent crystal goblets. As it is not recommended to age this wine for very long, and it should therefore be drunk within two or three years of purchase at the latest. The bottles should be laid horizontally in a cool, dark, humid wine-cellar.